An overstuffed studio has its hazards and while I was opening a flat file drawer today, a drawing board perched precariously on an easel on which a grouping of plein air canvases was arranged, fell to the floor and dragged everything down with it in a clatter of uncontrollable junk. The drawing board tilted when it hit, putting a sharp corner all the way through a painting I’ve been struggling with for the last two days. My first thought was Oh, Crap! and my second thought was, Hallelujah! Which means that I’ve either evolved into an enlightened being who can let go of material attachments, or I’m relieved that I don’t have to screw around with a bad canvas. Or maybe someone up there likes me. 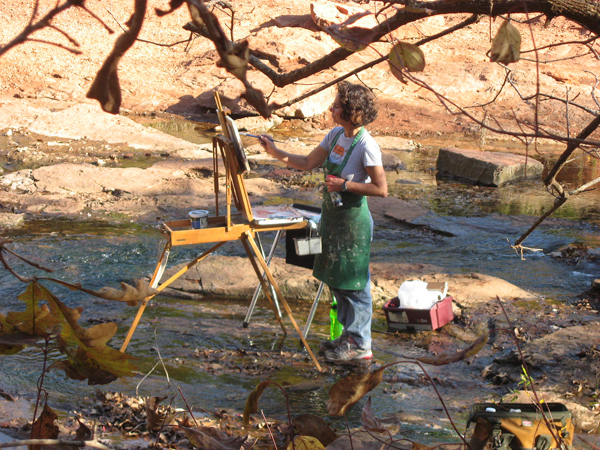 In any case, Saturday was blissfully spent painting on red rocks in the hot sun or in the middle of a shallow stream with my friend Becky at Martin Nature Park, just north of OKC. 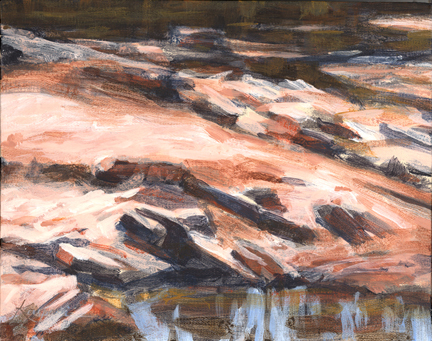 I got two more starts for my plein air series, and the survivor of the two is shown above. I like this one better anyway. I’ll post the defunct one so you can see why I don’t regret its demise. It’s all practice, anyway. If I don’t make another post before Thursday, happy Thanksgiving, everybody! Eat, drink, and draw! Cooling my heels while I work on a doomed painting. Photo by Becky Way. You really should look into getting an OpenBox M easel for painting on location, much easier than that wooden monster you have here. I like your work even if you do use old fashioned equipment. Happy Thanksgiving. My cat decided to jump onto a piece on my french easel not long ago, turning the whole thing over. Unfortuantely I’d left a tray of really nice pastels sitting out on the open drawer. Pastel dust is really hard to get out from between the cracks of a hardwood floor, you know? Still, I think ripping a painting would potentially be worse. I’m glad it wasn’t your favorite! I love the 100 starts idea. Will you then plan on going back and finishing them? Eek, pastel dust everywhere-at least my cat wasn’t involved in my own case. On the starts, if I get a really good one I might try to finish it. It might be just taking it a little farther without overdoing it. So far in the series I feel like I’ve gotten two “keepers” to which I added a little more paint and hopefully improved them. The nice thing about this exercise is that if you don’t like a start, you can paint over it without too much anguish. Or put a hole through it! Your blog has been chosen by W.R. Jones from the Cafe Crem Team to participate in the 8 random thoughts meme. You are invited to keep the meme going, or simply bask in your new found fame! Did standing in that stream tucker you out? Let’s see some more of your great work please. By the way I did not select you for the 8 random thoughts business. That is one of Miki’s ideas that I knew nothing about. I don’t even know what a meme is. 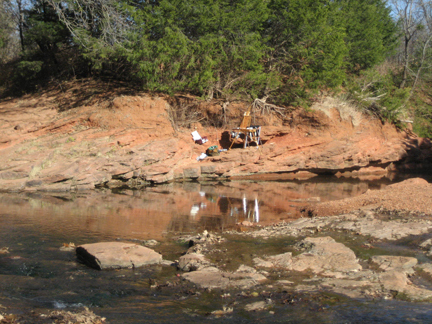 And, Happy holidays if you don’t blog before Christmas – hope you get a great plein air setup to enjoy.